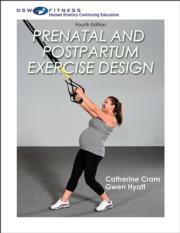 This continuing education course includes a workbook and exam that will guide personal trainers, group exercise instructors, and fitness professionals in designing safe and appropriate exercise routines for pre- and postnatal women. This program has been approved by Lamaze International for 8.5 Lamaze Contact Hours (LIN 16-07). These hours may be applied towards recertification as an LCCE educator under the learning competencies 1 - 3.